Homeport is the largest developer of affordable housing in Central Ohio with more than 6,000 low- and moderate-income residents, half of whom are children. High quality partnerships help us in promoting and providing stability and opportunity to our residents. Columbus REALTORS is the fourth in our partner profile series. HOMEPORT: Columbus REALTORS’ history seems long and its membership significant. What can you tell us about it in that regard? Why was it formed and what does it do on a daily basis for its members and the Central Ohio community it serves? COLUMBUS REALTORS: Columbus REALTORS® was founded in 1908 for the purpose of raising the level of professionalism in the industry. In the early 1900s, there was graft in many professions, including real estate. Brokers came together to form an association based on cooperation and professionalism. By association, the public was able to be comfortable that they were working with experienced professionals who would provide service in their best interest when it came to buying and selling private property. That objective remains the same today. Columbus REALTORS CEO Stan Collins has been a member of Homeport's Board of Directors since 2010. Columbus REALTORS® is a professional trade association comprised of over 8,000 real estate professionals engaged in residential sales and leasing, commercial sales and leasing, property management, appraisal, consultation, real estate syndication, land development and more. Our mission is to provide leadership for the REALTOR® community by protecting the interests of its members, promoting their value to the real estate consumer, setting high standards for professional practice, and advocating private property rights. COLUMBUS REALTORS® actively connects consumers to property information and resources, while advocating for the interests of property owners in the Columbus Region. HOMEPORT: What is Columbus REALTORS connection to the affordable housing industry? COLUMBUS REALTORS: The Affordable housing market is predominantly first-time home buyers. As Columbus REALTORS® is particularly interested in helping first-time home buyers begin their dream of home ownership, our members meet regularly to discuss buyer education, credit counseling, low interest mortgages, down payment assistance programs, central Ohio neighborhoods, changing demographics, legislative issues, energy programs, etc. Columbus REALTORS* has a very active Affordable Housing Committee of members that seek to implement programs that address affordable housing issues and track information about financing programs available for homes $180,000 and below. Columbus REALTORS® also created the Certified Affordable Housing REALTOR® (CAHR) designation to acknowledge those local members who have served this market through transactions, education, association activity and community service. Columbus REALTORS President Pat Grabill and Homeport's First Executive Director, Beth Hughes, in 1992. HOMEPORT: How does an organization like Homeport fit into Columbus REALTORS mission? We know you were one of the founding organizations of Homeport in 1987! COLUMBUS REALTORS: Columbus REALTORS® has always believed that the organization and its members have a responsibility to contribute to the health and welfare of our community. To that end, in 1987, Columbus REALTORS®, led by three of our past Presidents - Bob Weiler, Don Kelley and Max Holzer - joined officials from Franklin County, the city of Columbus and private companies to create the Columbus Neighborhood Partnership, later known as the Columbus Housing Partnership, and today as Homeport. With the public and private sector working together, Homeport was founded to provide adequate housing for Columbus’ low-income and homeless citizens. In its initial year, Homeport had a budget of $2.5 million, including a $150,000 donation by Columbus REALTORS®. Three years later, Homeport had helped more than 200 low-to-moderate income families become homeowners. Today, that number is in the thousands. 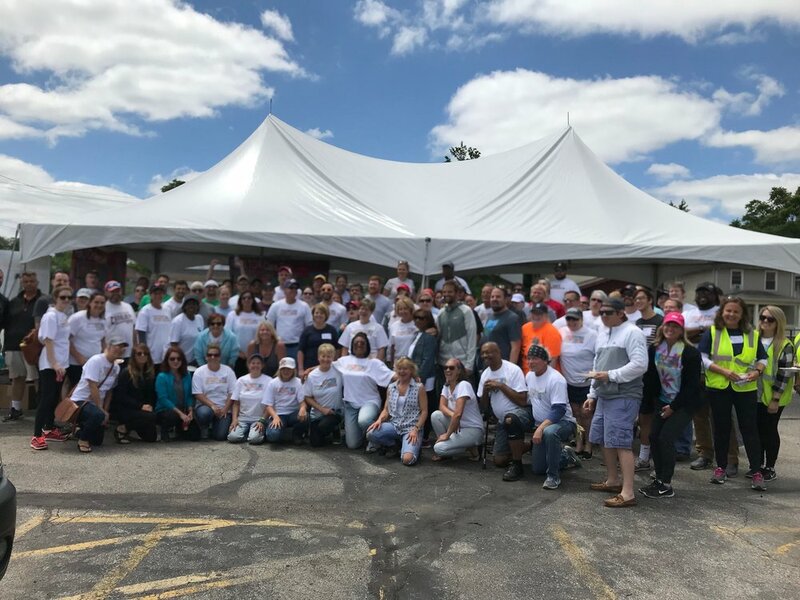 Additionally, Columbus REALTORS® has partnered with Homeport on several of its annual REALTOR® Care Day events, which is a one-day event where hundreds of REALTORS® undertake community service projects all over central Ohio. Realtor Care Day in June 2018 extended to Marysville. HOMEPORT: What does Columbus REALTORS envision as its key characteristics, role and impact 10 years from now? COLUMBUS REALTORS: In the coming years, as the Columbus area grows and evolves, we will continue to take action in the best interest of our members and property owners, anticipating and responding to changes in the market, technology, and politics in our industry. -- We are Approachable. Both the public (government officials and other industry-related organizations) and all of our members know our door is always open – for information, advice or a place to voice opinion. -- We are Responsive. We take action for the best interests of our members, the real estate industry, and changes in the market, technology, and politics when applicable. -- We are Progressive. We are the leader in delivering relevant information, fostering connections, providing state-of-the-art technology, and offering unparalleled professional development opportunities. A big focus of Columbus REALTORS Realtor Care Day 2018 was the Milo-Grogan neighborhood, where members made improvements to 17 homes, one business and a community garden. Homeport recently built 33 affordable lease to purchase homes in Milo-Grogan as part of a revitalization initiative.